The last shoe to drop for a 100% Priced-for-Perfection market is "good progress" in the China Trade war negotiations. After that, the market will be extremely vulnerable. But, there is still some fuel in the bulls' tanks to take SPX to the 200ma (I hope!). NAIM has soared above 70, good times again! McClellan Oscillator has busted the lower panel and invaded the upper pane! Incidentally: The last 3 times the Fed was forced to stop its rate hike cycle a recession soon followed. 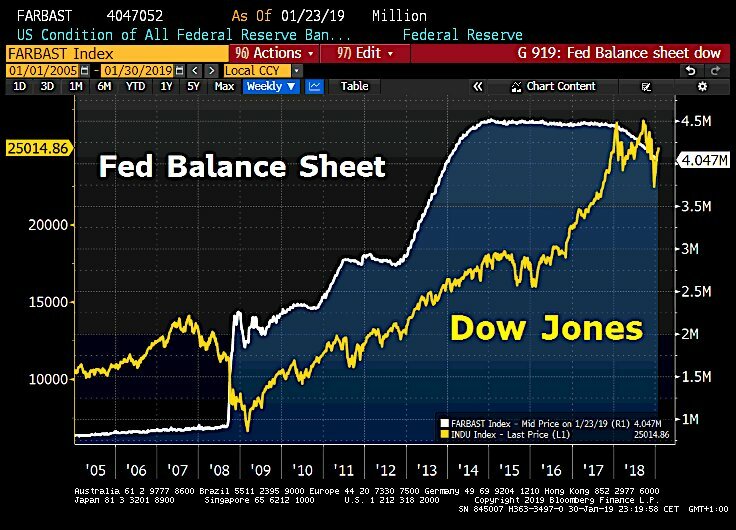 "The Fed is officially at the market's mercy now" My translation: "the Fed is at the mercy of a massive bubble that IT CREATED and now cannot unwind without throwing the economy into a full-blown depression." Soon the market will ask why such an abrupt change... Maybe it was the market, maybe it was Trump's tweets, maybe it was the Fed shareholders (large banks) telling them what to do, but... maybe they are scared of something that should be scaring investors as well. And there it is. 10 days ago the put/call ratio for the VIX was 20% (too many betting on higher VIX). Today's ratio: 113%. Bob P worries that everything is priced in. Thinks the market is very pricey. In January 2019 the Fed went full capitulation dovish. And still $SPX is below its 200MA. Will be building a BIG position in QQQ puts as this rally continues. It seems as if was only last week, when it was a few weeks ago, that I was worried about not buying more CALLS when the market was trading in the SPX 2350/2450 range; now, I am worried I may not have more PUTS than I should as the market climaxes in the SPX 2700 region. Edited by redfoliage2, 31 January 2019 - 10:37 AM. I am paying thru my nose for JUNE 2019 QQQ puts.... deep in the money. However, while the markets are celebrating the very clear confirmation that the "Fed Put" is alive and well, it should be remembered these "emergency measures" are coming at a time when we are told the economy is booming. As Dalio noted, one of the biggest issues facing global Central Banks is the ongoing effectiveness of "Quantitative Easing" programs. "In our opinion, the Fed's new warm and cuddly tone is all about supporting the stock market. The market fell nearly 20% from record highs in the fourth quarter and fear set in. There is no doubt President Trump's tweets along with strong advisement from the shareholders of the Fed, the large banks, certainly played an influential role in persuading Powell to pivot. "Jerome Powell is a prisoner of the institutions and the history that he has inherited. Among this inheritance is a $4 trillion balance sheet under which the Fed has $39 billion of capital representing 100-to-1 leverage. That's a symptom of the overstretched state of our debts and the dollar as an institution." As Mike correctly notes, all it took for Jerome Powell to completely abandon any facsimile of "independence" was a rough December, pressure from Wall Street's member banks, and a disgruntled White House to completely flip their thinking. In other words, the Federal Reserve is now the "market's b*tch." "We're the hottest economy in the world. Trillions of dollars are flowing here and building new plants and equipment. Almost every other data point suggests, that the economy is very strong. We will beat 3% economic growth in the fourth quarter when the Commerce Department reopens. We are seeing very strong chain sales. We don't get the retail sales report right now and we see very strong manufacturing production. And in particular, this is my favorite with our corporate tax cuts and deregulation, we're seeing a seven-month run-up of the production of business equipment, which is, you know, one way of saying business investment, which is another way of saying the kind of competitive business boom we expected to happen is happening." - Larry Kudlow, Jan 24, 2019. Of course, the reality is that while he is certainly "spinning the yarn" for the media, the Fed is likely more concerned about "reality" which, as the data through the end of December shows, the U.S. economy is beginning to slow. "As shown, over the last six months, the decline in the LEI has actually been sharper than originally anticipated. Importantly, there is a strong historical correlation between the 6-month rate of change in the LEI and the EOCI index. As shown, the downturn in the LEI predicted the current economic weakness and suggests the data is likely to continue to weaken in the months ahead." and also a possible pop after AMAZON's earnings. However, the bull needs fuel, every session.. I am watching closely how the market will react after a pullback of more than 20 SPX points; that is really important for me; I could go bullish after that, depending on the reaction of buyers on that pullback. Edited by dTraderB, 31 January 2019 - 11:04 AM. Now it's unavoidable for the market to test SPX 200 dma around 2740. Edited by redfoliage2, 31 January 2019 - 04:10 PM. That's the key, always has been since it moved above the 50ma. basically, this test will determine how high we go.